In The Eyes Of The Beholder: Sad And Uninspired? Scratch That! 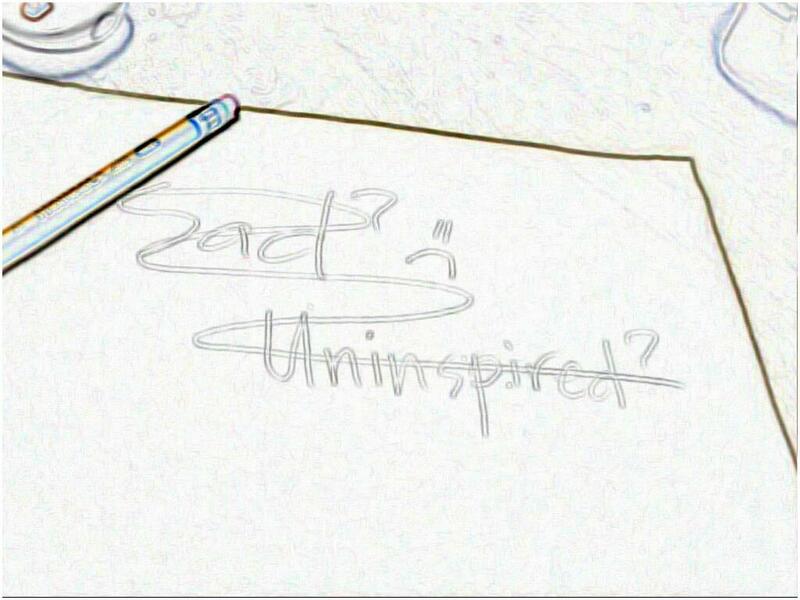 Sad And Uninspired? Scratch That! I read something posted on Facebook about understanding a person. That whatever they do reflects how they feel. I can only remember one line from that quote: That - "if a person sleeps a lot, that means he's sad". I slept a lot lately. Does that mean I'm sad? I really don't know. But I am uninspired, I know that. I used to have so much enthusiasm especially on things I love and like to do. I used to sing a lot but ever since I was told about some people who doesn't like my singing, it somehow affected me. So I seldom sing now. I used to play my guitar and sing a lot, even post my covers of songs on Youtube. But I no longer do that. I used to blog a lot, but now I feel like I'm having a hard time composing articles for my blogs. Most of the time, I can't find the right words to say and sometimes I don't think anyone is really interested in my thoughts and the things I wright about. I know something's wrong. I'm having a hard time putting things in perspective. I know I should and hopefully, since I put this in writing today, I'll pull myself back together soon. I hate being uninspired. It makes me sad. And I don't want to be sad for a long time. Take a little break and go somewhere peaceful. Think of all the good things in your life and shake off all the negativity. I do that when I am feeling down. It's a big LIE. I need decent hours of sleep para hindi ako ma-irritate to situations on hand. But it doesn't implies that I am sad. comedy ang life ko eh. Yes uninspired and for me it's gonna be T.I.R.E.D. I used to sleep longer during weekends. regaining energy lost for the whole week. that's part of being human...:) everyday is not a good day...am sure you'll get inspired pretty soon. Hmm. I hope you are feeling a lot better now, my cousin dearie. Life's letdowns sure make us feel unhappy but we can't be sad for that long. Life is too short to be wasted. Endeavor to do things that will keep you busy and happy at the same time. Go out with friends apart from the same people you're going out with when you feel sad. Who knows? The negative vibes come from them pala. LOL! Cheers!